This is one dessert that is to die for! 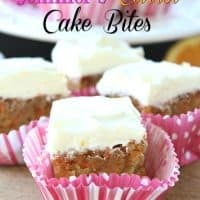 Jennifer’s carrot cake bites are so delicious and the small size let’s us feel less guilty for eating such a divine, moist, rich treat! So delicious, so rich, so moist, so amazing! 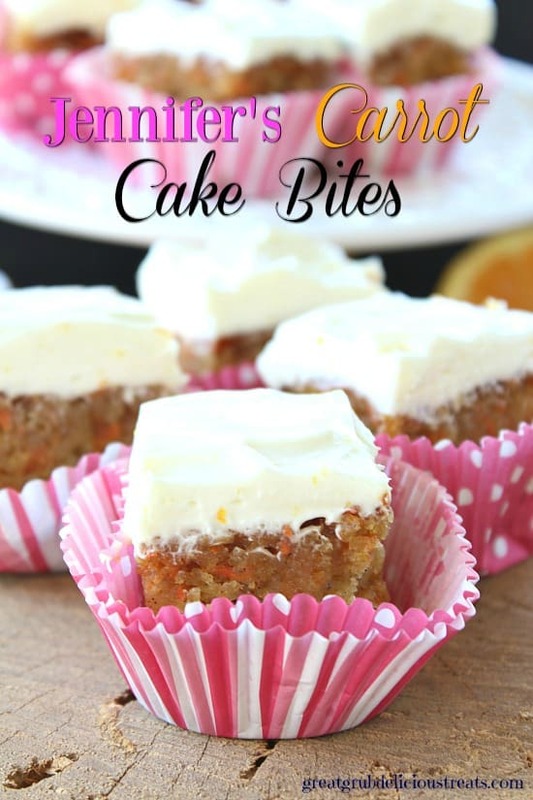 These carrot cake bites are moist little bites of heaven! 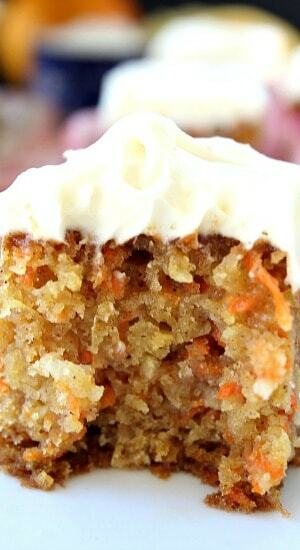 I’ve tried many carrot cakes before but I have to say, this is my favorite! 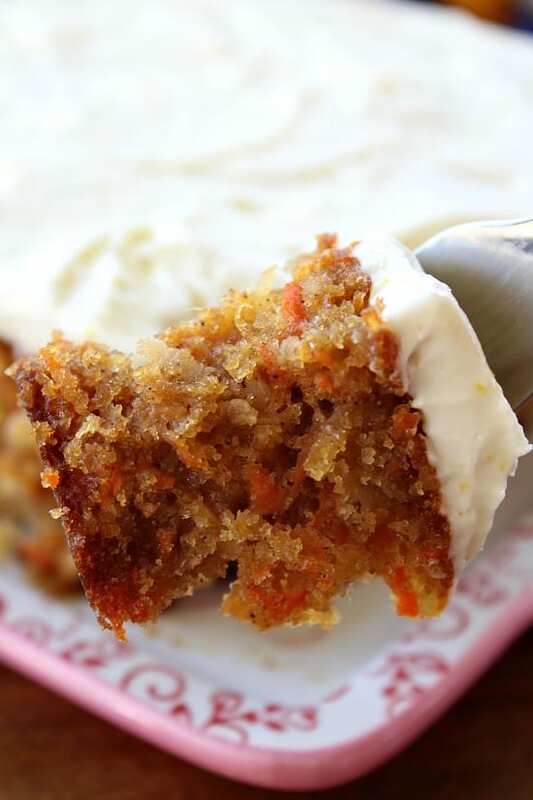 The buttermilk glaze that you pour on top, right after the carrot cake comes out of the oven, is SO absolutely delicious! I kept sipping spoonful after spoonful of the buttermilk glaze right out of the saucepan! Oh my, so amazing! What you do is poke lots of little holes in both cakes as soon as they come out of the oven. Next, pour the buttermilk glaze over the tops of both cakes. The glaze will soak into the cake making these bites that much more delicious! Let them cool for about 15 minutes, then remove the cakes from the baking dish, and let cool completely before you frost with the AMAZING orange cream cheese frosting! Just look at how moist these bites are! 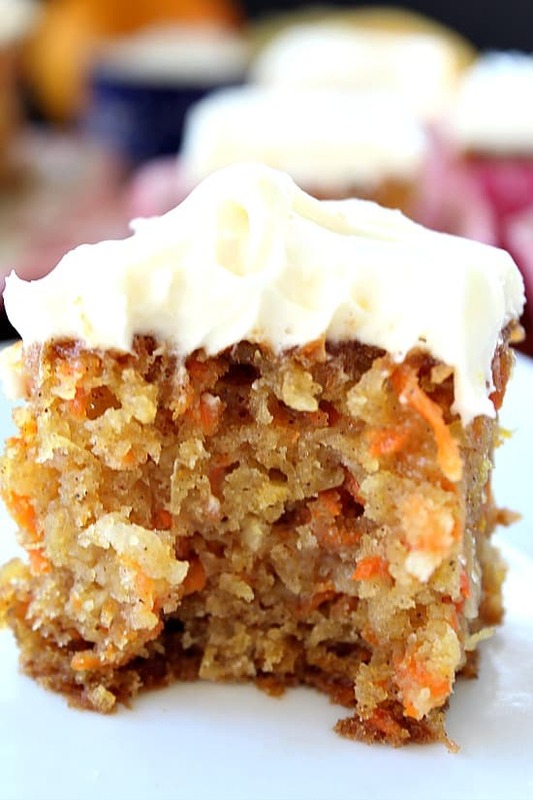 Loaded with carrots, pineapple, coconut, topped with a buttermilk glaze and then frosted with a delicious orange cream cheese frosting… talk about super yum! This is definitely to die for! I think I’ve died and gone to heaven! These are that D.E.L.I.C.I.O.U.S!!!! 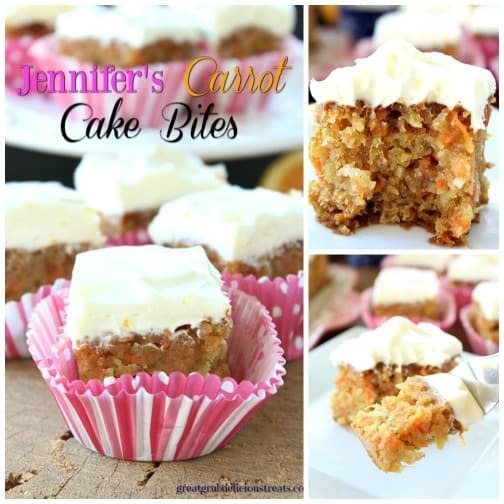 So try Jennifer’s carrot cake bites the next time you are even thinking of baking a deliciously satisfying cake! You will be so happy you did! And, then you can enjoy these tasty treats of yumminess! This is my good friend Jennifer and her husband Tom. 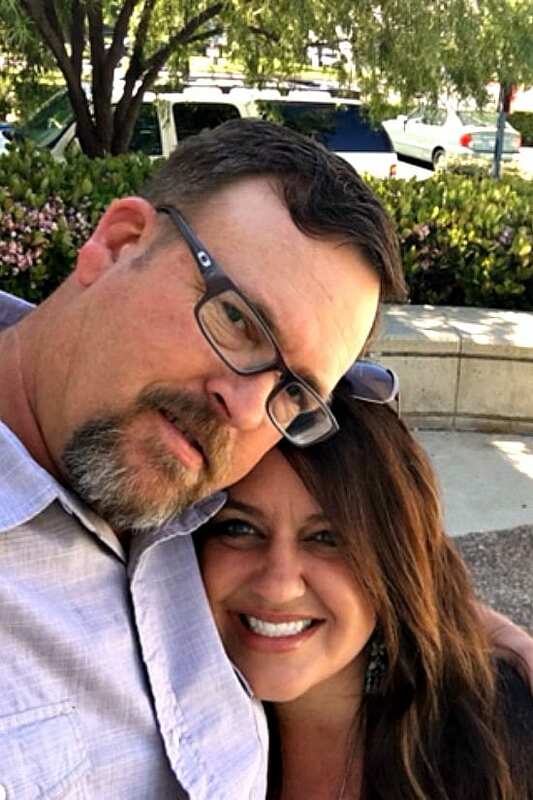 Talk about two wonderful human beings… These two are always helping others and doing nice things for people. Jennifer is my co-worker and a Case Manager with Hospice. She takes care of our Veterans who are on hospice at the VA home. Jennifer is an amazing RN and I am soooo fortunate to have met her and to be able to work side by side with her. I have learned so much from Jennifer. Most of all, I’m so thankful that I can call her my friend!! Thanks for an amazing cake recipe that I can add to my collection of delicious cakes! You’re awesome! Lightly grease 2 8X8 baking dishes. Lightly grease and dust with flour, set aside. In a medium mixing bowl, whisk together flour, baking soda, salt and cinnamon. In a large mixing bowl, combined eggs, oil, buttermilk, sugar and vanilla. Stir in flour mixture with a wooden spoon. Fold in grated carrots, flaked coconut, and crushed pineapple until combined. Pour into prepared baking dishes. Bake for 30-35 minutes or until tooth pick inserted in the center comes out clean. Remove from oven and poke lots of little holes throughout. Immediately pour the buttermilk glaze over both cakes. Let cool in baking dishes for 15 minutes. Remove cakes and let cool completely on a wire rack. 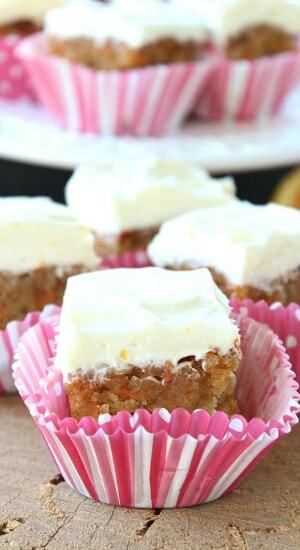 Spread the orange cream cheese frosting on top. In a small saucepan, combine sugar, baking soda, buttermilk, butter and corn syrup. Remove from heat. Add vanilla. Stir until combined. In a medium mixing bowl, beat butter and cream cheese until light and fluffy. Add vanilla, powdered sugar, grated orange peel, and fresh orange juice. Frost each cake once cooled completely. Cut into small pieces and place in cupcake liners. Recipe from my friend, Jennifer.